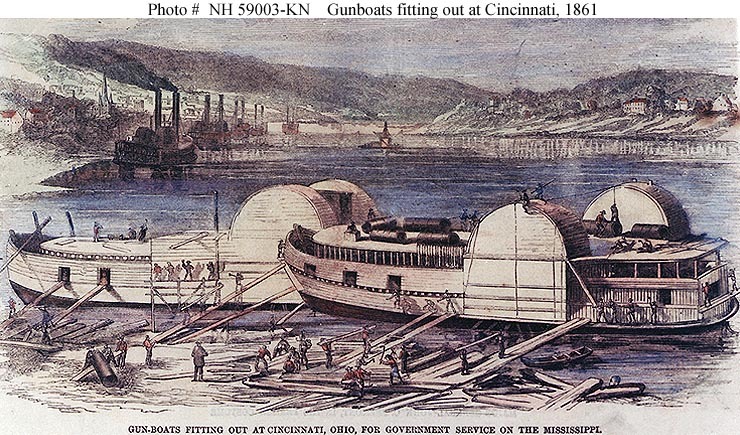 150k "Gun-Boats Fitting Out at Cincinnati, Ohio, for Government Service on the Mississippi." 108k "The Flotilla of Federal Gunboats for the Protection of the Ohio and Mississippi Rivers, Under the Command of Captain John Rodgers, U.S.N. -- From a Sketch by our Special Artist at Cairo, Illinois." 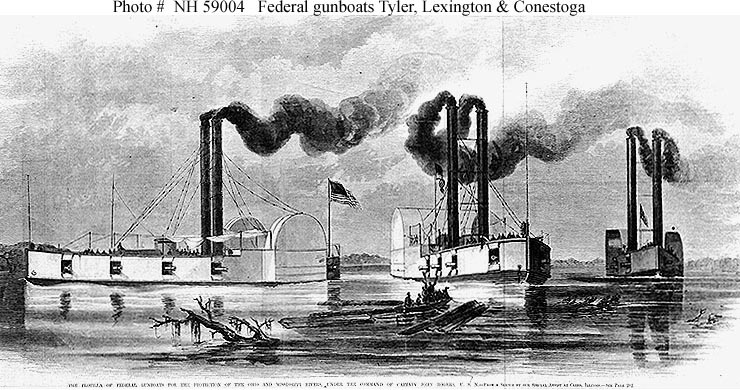 Line engraving published in "Frank Leslie's Illustrated ...", 1861, depicting the "timber-clad" gunboats USS Tyler, USS Lexington and USS Conestoga. 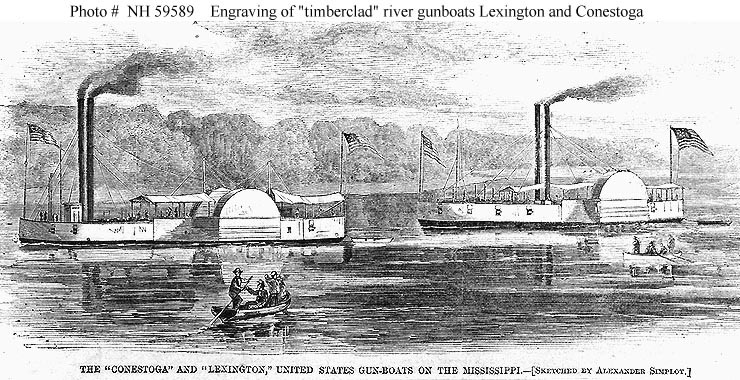 126k "The 'Conestoga' and 'Lexington,' United States Gun-Boats on the Mississippi." Line engraving, after a sketch by Alexander Simplot, published in "Harper's Weekly", 1861. It depicts USS Conestoga on the right, with USS Lexington at left. 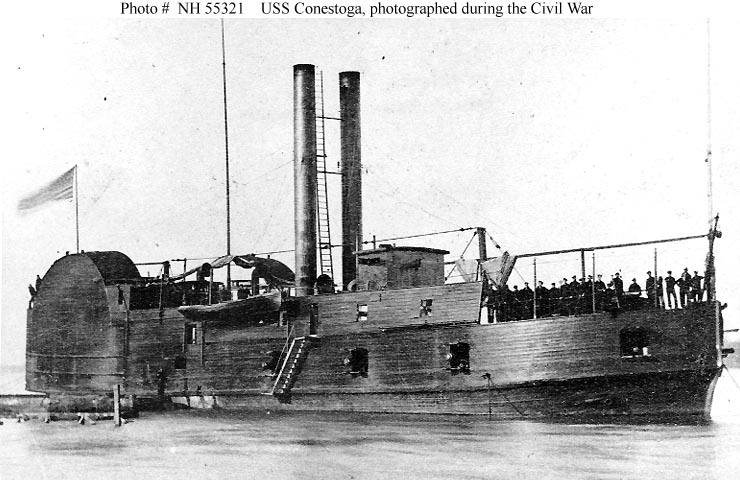 85k USS Conestoga on the Western Rivers during the Civil War. 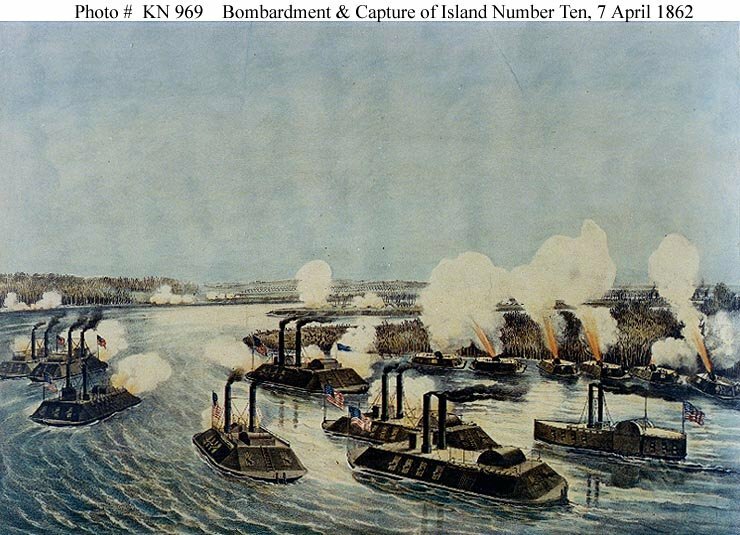 114k "Bombardment and Capture of Island Number Ten on the Mississippi River, April 7, 1862." 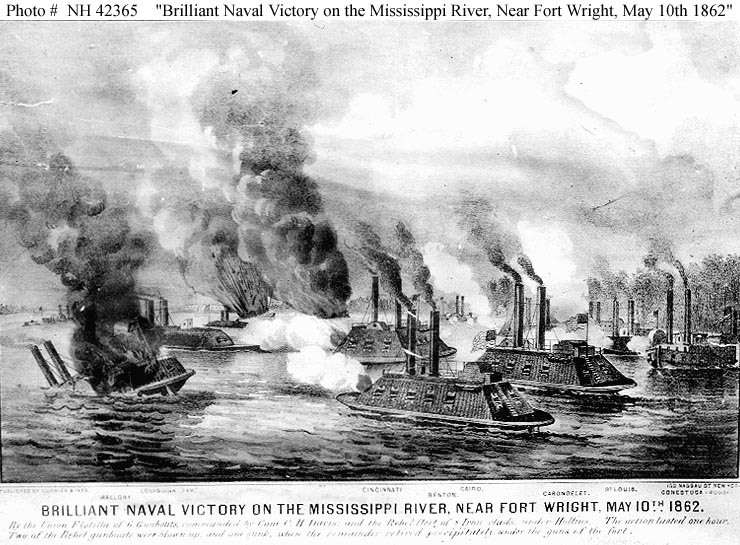 126k "Brilliant Naval Victory on the Mississippi River, Near Fort Wright, May 10th 1862." Brilliant Naval Victory on the Mississippi River, Near Fort Wright, May 10th 1862 by the Union Flotilla of 6 Gunboats, commanded by Com. C.H. Davis, and the Rebel fleet of 8 Iron-clads, under Hollins. The action lasted one hour. Two of the Rebel gunboats were blown up and one sunk, when the remainder retired precipitately under the guns of the fort. 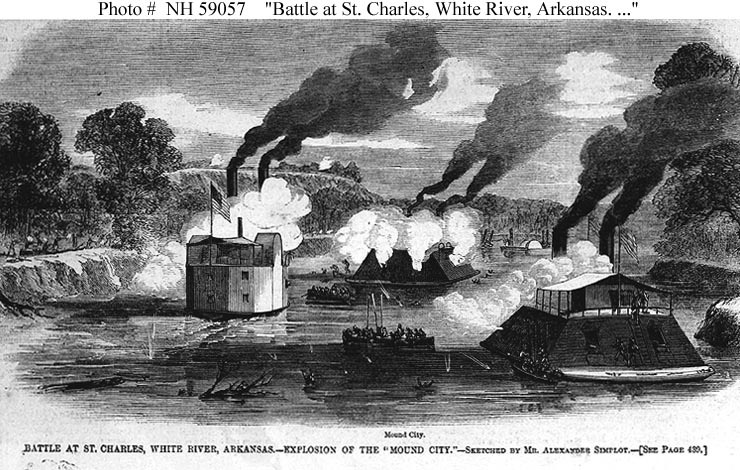 122k "Battle at St. Charles, White River, Arkansas--Explosion of the USS Mound City". Line engraving after a sketch by Alexander Simplot, published in Harper's Weekly, 1862. This action between Federal gunboats and Confederate shore batteries took place on 17 June 1862. USS Mound City was disabled by a shot that penetrated her steam drum, causing heavy casualties among her crew. Other U.S. ships present were the ironclad USS Saint Louis (seen in the right foreground) and "timberclads" USS Lexington and USS Conestoga. The gunboat in left center is also a "timberclad".